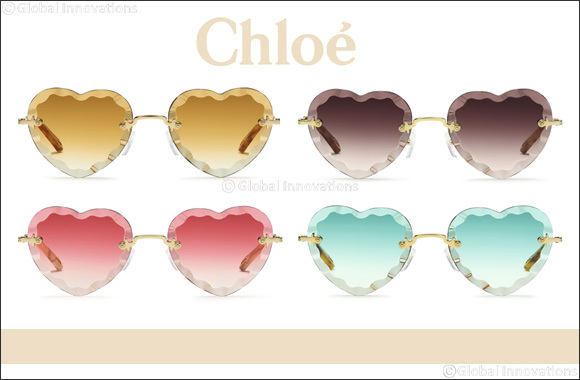 November 08, 2018: Chloé’s unique aesthetic distinguishes the new Spring/Summer version of the iconic “Rosie” style, now revamped with a subtle heart-shaped design. The brand’s artisanal flair is revealed in the intricate finishing achieved by applying a double milling phase and a hand-made buffing process to the 4 mm lenses. The two techniques are expertly combined to create a multifaceted effect glowing with grace. The 3-piece frame is equipped with a metal bridge and matching temples fitted with temple tips made with Mazzucchelli acetate and fixed to the front through sunburst-shaped screws. Both elements are embellished with an exclusive chiseled pattern that further enhances the romantic appeal of this unconventional style. The new Rosie sunglasses are completed with flexible hinges and the signature metal teardrop cutout serving as an aesthetic and functional detail for attaching the chain accessory. An additional touch of refinement comes from the lenses’ color palette, enriched with a smooth gradient effect that slowly softens to crystal clear on the lower part. Available in Gold with Gradient Wine, Gradient Turquoise, Gradient Brick or Gradient Coral lenses. Chloé eyewear is produced under license by Marchon Eyewear, Inc., one of the world’s largest manufacturers and distributors of quality eyewear and sunwear.